Right now everything seems to be a little bit crazy around here. If it ain't one thing, it's another. I mean this in a good way though. First off, you know those dining reservations I made for our next Disney trip? You know, the ones I got up at 5 am to make on Easter morning so that we got everything we wanted at the times we wanted??? Wellllll, Mom knew about it but didn't tell me until this past Wednesday that she now wants to go with us. Ack! I totally freaked out because I got some pretty difficult reservations (Hoop-De-Doo Musical Revue, Cinderella's Royal Table in the castle, Liberty Tree Tavern on a Halloween Party Night where the characters dress in Halloween costumes instead of their usual patriotic garb, etc.). If she would have told me 5 days before that I would have been able to easily add her into the head count when I initially called. After spending an hour with Disney Dining Wed. afternoon, I managed to get her into almost all of our ressies. Cinderella's Royal Table had to be booked an hour earlier (4:25pm) but it was either that or really late at night (8:15pm). The late time wouldn't have worked because the Spectromagic parade is at 8pm that night in the Magic Kingdom. That is our main reason for being at that particular park that night. Anyhoo, we were just lucky to get a ressie at Cindy's because it is usually booked completely at 180 days out. As for the Liberty Tree Tavern, I knew I wouldn't be able to get her in and I was unfortunately correct. It will be a party night (Mickey's Not So Scary Halloween Party) and there are only 3 sit-down restaurants in the Magic Kingdom. Everyone makes those ressies as quickly as they can because it is super convenient to eat in the park on a party night. LTT is the best one to book for MNSSHP because it is the only character dinner where they will be in Halloween costumes too. It will be a blast. Mom will likely stay at the hotel and veg out that night. She really doesn't care to be in the MK from 7pm-midnight anyway, lol. I don't think that we did too bad. Out of 11 ressies, only 1 didn't work out with adding her in. BTW-We are so glad that she decided to go!! Only 2 more days until Bon Jovi!!! Hubby and I are incredibly excited to see them yet again. We have been to most of their concerts since their comeback and we always have such a wonderful time. This will be our first time seeing them in Denver so it will be cool to go somewhere new. Hayden started soccer a couple of weeks ago and he has his first game today. He is doing so much better than last year. At 5, he seems to understand a bit more than he did last year. He still isn't great but neither are his teammates, lol. I give him another year or two to really be able to play. This coming week is spring break for Hayden's school so I am going to go bezerk. H gets bored so easily. I am going to have to find him some things to do to entertain him. I know several of you have tried to email me or phone me. I will get back to you all next week after things have died down. Sorry for the delay. Today marks 180 days out before our next trip to Disney World so I had to get on the phone this morning at 5am to make all of our advanced dining reservations. Thank the Lord, I got everything that we wanted at the times that we wanted. We are planning to eat at Cinderella's Royal Table (in the castle-whoo hoo! ), O'hana, Kona Cafe, Rainforest Cafe, Teppan Edo, Whispering Canyon Cafe, Sci-Fi Dine In (our all-time family favorite), Hoop Dee Doo Revue (dinner show), Chef Mickey's and Liberty Tree Tavern (my personal favorite). I am so excited! Some of the restaurants are ones we liked from last time and some are going to be new for us. It will be awesome. Yea, we lost a few, lol. The stickers are Transformers. Whoo hoo, the new surrogacy journey is officially beginning! I passed the initial screening and now I am scheduled for my medical screening on 4/15. I get to fly to San Francisco for the first time. How cool is that? I am not planning on sight-seeing this trip but me and my family will get to when we go for the transfer (hopefully in July!). I can't believe how quickly everything is moving. I can't wait!! I know I have been a little slack on the blog lately but last week kinda stunk and I had nothing to talk about. Everyone in the house had some sort of sickness. This week is going much better though. This past Sunday was especially crappy for me. I met a gal for lunch (we had previously met at Target during the week and hit it off). We had kids the same age and we shared similar interests. I really thought that I had found my new best friend. Well, she had an alterior motive that took me by complete surprise. We chatted for the first 30 min. of our meeting and everything was going well until she wanted to talk about what our husbands do for a living. I told her that Clayton was a chemical engineer and then she proceeded to give me a vague description of her hubby's Internet job that he does from home. I was intrigued so then I asked more questions (which is apparently what she wanted me to do). She then pulls out some brochure and goes on to tell me that my hubby could make good money from home too. She bragged about the figures that he could make (because her hubby makes that) and I hate to tell her this but my hubby still makes a heck of a lot more (so ha!). I was appalled and felt so used. I can't believe that she would try to befriend me just to get us to join in on their crackpot business venture. I definitely didn't see that one coming. Ugh. Now I will never trust anyone that I strike up a conversation with. Afterward, I took off to Target for some much needed retail therapy. BTW-These pics would have been alot clearer if I would have used a better lens. I was too lazy to walk outside so I used my big lens to shoot from inside the kitchen. They were playing a long way from me so I just used Picasa to crop in. Time to get down to business. My cabinets finally were completed this morning. I finally quit procrastinating and just did it. It really helped that hubby took the kiddos out with him to do some shopping. The cabinets pictured above are the ones on the right side of my sink. I keep all my plates and bowls in cabinets above the bread box. The corner cabinets also contain my roasting pan, food trays, kid bowls/plates/trays, and coffee mugs. This is the little cabinet next to my dishwasher. Looks a bit narrow, huh? I remember looking at it and wandering what the heck to do with it when we moved in. You would think that it would be perfect for baking sheets but that doesn't make sense because there is already a baking sheet drawer below my ovens and the location isn't convenient to the oven area. I decided to store my cooling racks and serving trays in there. It also has a dish rack in it but I am going to throw it out now that I think about it (it hasn't been used in ages). This is the main cooking area of my kitchen and where I spend alot of my time. The cabinet to the left contains alot of appliances and containers with the top shelves holding the least used items and the bottom ones holding frequently used items. The middle cabinets above the microwave hold all of Clayton's beer glasses and mugs. I also store items to make mixed drinks on the top right shelf. The cabinets above the fridge contain 3 bins and a large Ryland folder that contains all of the information about our house. We rarely access these cabinets so I decided to store tax refunds in one bin and all of our operation manuals in another. The third bin is empty until I find a need for it. This silverware drawer on the left side of the cooktop. The drawer on the right side contains all of my wraps and baggies (not shown as I forgot to take a pic). This my kitchen cleaning supply area under the sinks. I hope to get an organizer in there soon to make it hold 2 levels of stuff. Today I am focusing on our kitchen island which is also my main food prep area. In the left drawer I have a chrome silverware sorter and some loose tools (ha ha, that sounded like loose stools). The sorter is arranged by groupings: can openers, bottle cap openers/cork opener, ice cream scoops, thermometers/candy making supplies and potato peelers. The green container holds all of my corn on the cob holders plus a corn cob scrub brush. The main drawer holds more food prep tools and my cutting boards. 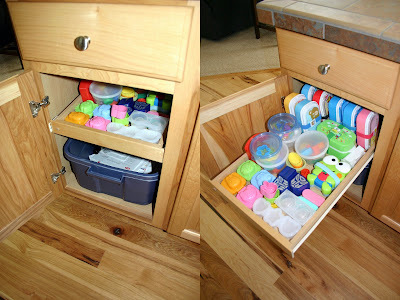 Here are my cabinets below the main drawer. The one on the left contains alot of spices that aren't used very much (I have a spice rack with the 40 most popular spices on my counter) and baking ingredients. I haven't really organized those 2 shelves just yet but that will be happening soon. The top shelf on the right has my measuring spoons/cups and some mixing bowls. The bottom right shelf has a large bin with lots of small Tupperware containers for leftover foods. Finding containers to pack Clayton's lunch has been a lot easier since I found this bin. It fits perfectly into the cabinet lenghth-wise and width-wise so we get maximum storage potential out of it. I hope you all are enjoying my organization posts. I will be focusing on all the other cabinets in my kitchen in the next post and that will be the final post for that area of my home (with the exception of my food pantry/refrigerator-those will have to come later as they are still a disaster, lol). Have a great day! BTW-Hubby and I were discussing the canisters on the window sill and we are going to get rid of them. We are also going to trade out the matching utensil holder and get a bigger one to replace it. I am thinking maybe a chrome one? This is my newly organized oven area. I put things that I rarely use on the top shelves (pasta machine, electric knife, and glass bread pans) because I can't easily access them. Using a step ladder from time to time is no big deal but heck if I am going to use one to get things that I need daily. I would like to note that my cabinets are really deep but I choose to only store things in the front part of them. I am blessed with more storage areas than I could ever need in this house so I don't push things back to where I cannot see them. Anytime that I ever did that in the past, I ended up forgetting what was in my cabinets and the stored items never got used. What a waste. Anyhow, the middle shelf over the ovens is used to store glass/porcelin bakeware and the bottom shelf stores all of my metal bakeware (and a few small glass bowls). The drawer below my ovens contains all of our baking sheets. In the cabinet on the upper right, I have all of my nice baking/serving dishes that my Grandmother gave me on the top 3 shelves. The bottom shelf contains everything that Clayton needs to make his morning coffee. The drawer on the right contains all of my aprons, hand towels, and pot holders. 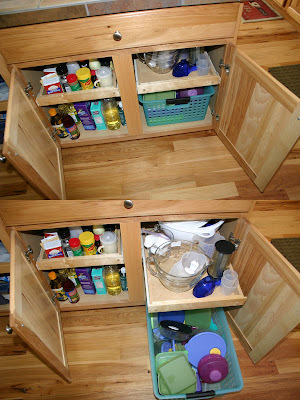 The cabinet below holds baking supplies. I keep a round Tupperware cake taker (not shown), a lazy susan that rotates my cake taker base (to aid in decorating) and cupcake liners on the upper shelf. That shelf pulls out for ease. The bottom shelf contains 2 Tupperware cupcake/sheet cake takers and a cupcake stand that I use for parties. Wanna see how I organize my island and bento stuff? That will be my next topic so stay tuned! File Box-This contains pretty much all of our stray paperwork (vacation stuff, medical forms, insurance, 401K, decorating ideas, school info., landscaping plans, etc.). Almost everything goes in here for safekeeping with the exception of store/restaurant coupons, take-out menus, tax returns and owner manuals (I will explain how I organized those later). Main Drawer-Phone Books, Directories, Small Notepads, Tape, Glue, Paperclips, Business Cards, Bon Jovi Tickets (Ha, just had to point that one out, lol), etc. Top Drawer-Haven't figured that one out just yet. Today is wacky day for Hayden's class. I sent him to school with his shirt backward, his hair mohawked and 2 different shoes. I sure hope that's "wacky" enough, lol. Emerson could stand for me to only take pics of Hayden so I obliged. That Big Rig shirt is so appropriate for my stout lil' guy, lol.